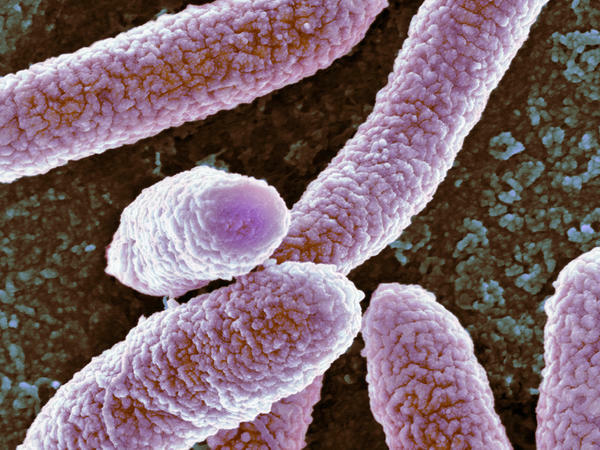 The CDC is trying to stop E. coli and other bacteria that have become resistant to antibiotics because they can cause a deadly infection. CDC Deputy Director Dr. Anne Schuchat calls them "nightmare bacteria" because "they are virtually untreatable." As many as half of patients with these infections die, she says. These bacteria are known as "enterobacteriaceae," and can include E. coli, Klebsiella, and Enterobacter. They can cause urinary tract infections and sepsis. They normally respond to antibiotics unless they have taken up a trait that causes drug resistance. The CDC identified more than 1,400 people who tested positive for these kinds of germs last year, including 221 who harbored newer, rare variants that have not yet spread across the country. They are most often found in people who have spent time in nursing homes and hospitals. One form of resistance, known as KPC, has already spread widely throughout the U.S. since it was first isolated in North Carolina back in 2001. But the CDC is trying to prevent four other strains, which have cropped up in isolated pockets, from taking hold. As part of that effort, in January 2017 the CDC established a nationwide network of labs to make it easier and faster to identify these killer bacteria. The CDC now reports that the first nine months of that effort were successful, though they turned up more of these rare germs than Schuchat expected. "These rare resistance patterns were widespread," she tells NPR. "Basically no age, race or gender was spared." But detecting these rare germs also presents an opportunity. Once a case is detected, the CDC, along with state and local health officials, can swoop in and reduce the chance that these germs will spread. Infection control measures in nursing homes and hospitals can be ramped up. Medical personnel and family members who have been in close contact with these patients can be tested rapidly to see if they are also carrying the dangerous bacteria. "Because of the additional testing capacity that we have, we have found a lot of these scary bacteria around the country but we've found them in ones and twos and not everywhere," Schuchat says. "So there's a chance to keep them from becoming widespread." That effort appears to be working. The percentage of bacteria carrying these potentially deadly drug-resistance features is on the decline, according to the CDC's new "Vital Signs" report in Morbidity and Mortality Weekly Report. The CDC is publicizing these efforts in order to encourage more doctors and hospitals to send their samples along to state testing labs or one of the seven labs that the CDC has established to run these samples quickly. And, despite gains in the United States, the problem is growing rapidly worse elsewhere in the world. The use – and misuse – of antibiotics is increasing quickly, especially in countries without the latest medical care. "We have to be doing this not only in the U.S. but across the world because this problem is definitely worldwide," says Dr. Jason Newland, a pediatrician at Washington University in St. Louis and a spokesman for the Infectious Diseases Society of America. Indeed, at least some of the cases the CDC identified were among people who had surgery overseas and got ill once they returned home. "So if you have had a healthcare procedure outside the country, you should tell your doctor that, if you're sick," Schuchat advises. The federal government set up a network last year to identify deadly germs called nightmare bacteria. Today the Centers for Disease Control and Prevention says that network is helping control these germs. And the CDC says the system would be even better if more hospitals and doctors would send in suspicious samples. NPR's Richard Harris reports. RICHARD HARRIS, BYLINE: The system focuses on bacteria that live primarily in the gut and that are resistant to most antibiotics, especially the drugs of last resort known as carbapenems. Dr. Jason Newland, an infectious disease specialist at St. Louis Children's Hospital, says he mutters under his breath when he encounters these germs in his young patients. JASON NEWLAND: I mean, I hate to say it, but I'm taking care of children where there hasn't been an antibiotic to use. HARRIS: He will improvise treatments as best he can, but nationally about half of all patients who get sick as a result of these germs do die. Prevention is the best strategy. So last year the Centers for Disease Control and Prevention established a network of labs and public health experts to identify cases early. Dr. Anne Schuchat, the CDC's deputy director, says in the first nine months of 2017 the network flagged more than 4,300 samples containing these carbapenem-resistant bacteria, including 221 samples that are rare varieties. ANNE SCHUCHAT: We have found a lot of these scary bacteria around the country. But we found them in ones and twos and not everywhere. And so there's a chance to keep them from becoming widespread. HARRIS: Finding these germs, which she calls nightmare bacteria, is just the first stage of the new network. SCHUCHAT: And then once we found them, we had staff support the facilities in a SWAT team approach to evaluate the infection control practices and to snuff out the infection. HARRIS: The hope is that by intervening before there's a full-fledged outbreak, health officials can keep these bacteria in check. Schuchat says this is especially important because these germs can pass their resistance genes on to other types of bacteria. SCHUCHAT: The good news is those resistance genes have not yet spread to all the other germs in the patient population. We have time to stop them from becoming common. HARRIS: Schuchat says the effort would be stronger if more hospitals and doctors participated. Infectious disease expert Jason Newland praises the CDC effort. But he says these germs readily cross international borders, and antibiotic resistance is a growing problem in less affluent countries. NEWLAND: So we have to be doing this not only in the U.S. but across the world because this problem is definitely worldwide. HARRIS: Indeed, at least some of the cases in the United States were among people who had surgery overseas, Anne Schuchat says. SCHUCHAT: And so if you have had a health care procedure outside the country, you should tell your doctor about that if you're sick. HARRIS: Details of this new effort are published in the CDC's Morbidity and Mortality Weekly Report. Richard Harris, NPR News. (SOUNDBITE OF ROBERT LE MAGNIFIQUE'S "POM POM ACE") Transcript provided by NPR, Copyright NPR.